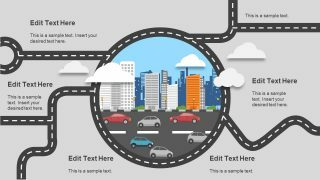 The Free Multiple Directions Concept for PowerPoint is a creative roadmap template. It is the graphic illustration of regular roadmap showing busy traffic in the central city. It has two-slide set of multiple direction PowerPoint containing clip art icons. The template represents opportunities and challenges through the roadmap diagram. For example, the multiple path options can demonstrate the list of opportunities a business can avail. Or, it can display the possible outcomes of the decisions makers for their choices. Therefore, the multiple direction roadmaps can easily show the flow of processes, their solutions, present and future state etc. The Free Multiple Directions Concept for PowerPoint has creative clip arts of building and cars on the road. This is a circular clipart where cars depict ongoing challenges, solutions, and opportunities. 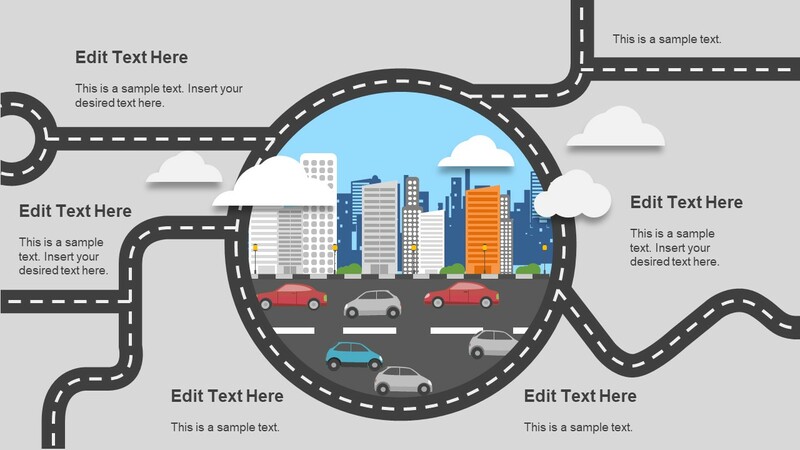 The free roadmap slide of PowerPoint has a circular road path around the city traffic icons. This path further shows the multiple directions in the roadmap. The path which splits into two can help explain the pros and cons of a decision. Similarly, the road with the round-about circle at the end can illustrate the continuous delivery or even the infinite loop error. 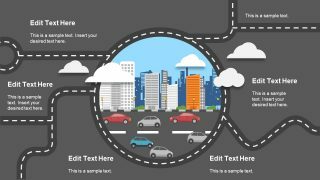 The roadmap PowerPoint is an attractive presentation of clipart cars, roads, skyscrapers, and clouds. These are the editable PowerPoint shapes creating a perfect illusion of roadmap diagram template. The free roadmap template PowerPoint of multiple directions is an all-purpose presentation. The PowerPoint roadmap templates are the generic concept designs. Professionals in industries ranging from science, engineering to arts and humanity, all can benefit from its design. The slides are one-scene presentations for achieving the set of goals. The amazing editable features and variety of clipart icons make this the most visually interactive diagram. Because the presenter can easily ungroup objects in the slide. And, use elements like cars to guide the audience about how close you are to your destination.